Under Canadian securities law, mutual fund companies are required to file an annual information form (AIF) every year, usually 90 days after the end of the company's most recent financial year. The AIF describes the investment objectives of various mutual funds, the way each fund is administered and operated, associated fees and other pertinent information. 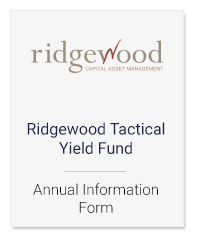 This information is designed to help investors make informed decisions about mutual fund products sold through Ridgewood Capital and to understand their rights as investors. These are listed below.